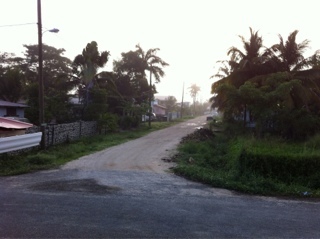 First morning in Belize. This is the view from the terrace of the Starfish House. We’re up and about, Caroline’s preparing a breakfast of johnnycakes, and I smell bacon frying. Going to 9:00am Mass at St. Martin’s and then to the village of Las Flores. Back to Belize City in time for the Super Bowl. It’s gonna be a good day!